The stereotype of the crabby neighbor who hates it when kids accidentally kick balls in his yard is as old as time, but it only exists in movies, right? Nope. Meet Scott Rings, who lives next door to Midland Elementary School in Poway, near San Diego. Over the last ten years, Rings says that he’s had to remove a flabbergasting 1,700 balls that came over the fence and onto his lawn. Playground balls of all shapes and sizes, littering his carefully-manicured yard day in and day out. Two years after the problem started, Rings’ beloved dog died. He has a hunch that the animal was killed by a basketball, but can’t prove it. Finally, he just couldn’t take it anymore. 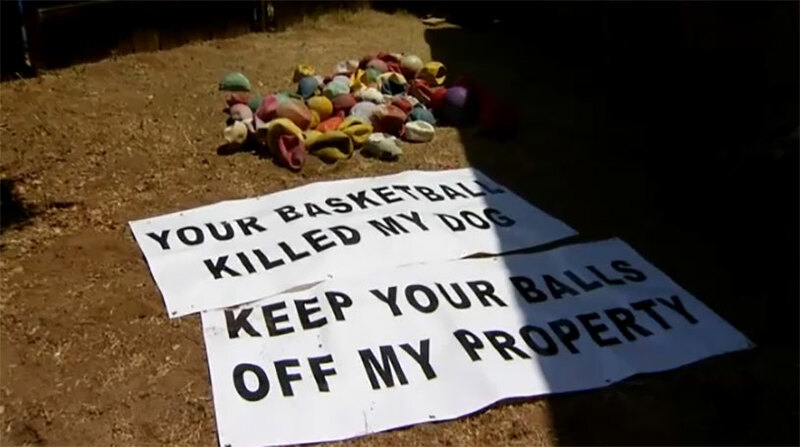 A few weeks ago, Rings erected two massive signs reading “Your basketball killed my dog” and “Keep your balls off my property” facing the schoolyard. Whether young children deserve to think about dead pets while they’re playing dodgeball is a whole different question, but it’s certainly within his rights to put signs up. The school shot back on their side of the property line by erecting first white tarps to block the students’ view of the signage, followed by a massive chainlink fence with blue plastic stretched across it. Rings said the kids are now playing “wall ball” against the fence, resulting in even more balls landing in his yard.